Ken Ham has dropped the price for public school kids to come to his anti-science creationist museum. He’s lowered the price to his life-size Noah’s Ark replica to just $1 per student. 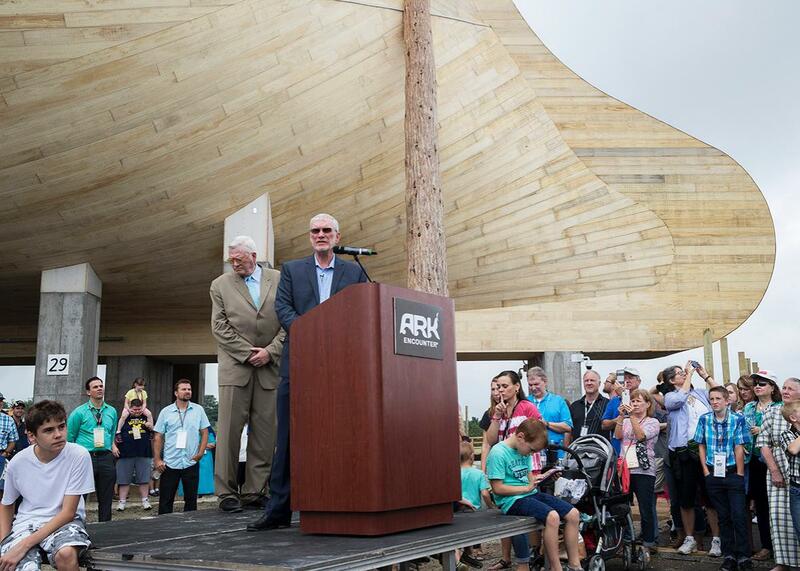 Ken Ham speaks at a ribbon-cutting ceremony for his life-size Noah’s Ark replica on July 5 in Williamstown, Kentucky. Ken Ham, the owner of the Creation Museum and also a recently built life-size model of Noah’s Ark, has dropped his price of admission. It is now nearly free for public school field trips, which, legally, should not be visiting this very religious attraction. “If coming as a public school class, students pay only $1 each and their supervising public school teachers come free,” Ham wrote on his Answers in Genesis website. Field trips to the Ark are unconstitutional. Public schools aren’t allowed to promote one religion over another. Taking a field trip to a 500-foot Noah’s Ark would promote one very specific version of Christianity, a version that takes the Bible’s Book of Genesis literally. The version that says God sent a flood to wipe out mankind for being evil but first told Noah to build a giant Ark hosting a male and female of each species so that life could continue after the flood. Ham, who opened his $100 million Ark on July 7 after nearly six years of planning and building, thinks this actually happened. But in order for a public school to teach something, there must be a valid secular purpose to teaching it. Public schools teach evolution, because as a country we want students to understand the science behind the diversity of life on Earth. We teach comparative religion classes so that students can learn about the different major types of beliefs that people have without promoting any specific belief system in particular. A trip to the Creation Museum doesn’t meet these rationales. Instead of comparing creationism to other belief systems, this Noah’s Ark field trip is presented as actual science and history. The Ark is “one group’s interpretation of the origin of man,” Ham says. But we don’t present random groups’ interpretations of the origin of man as science without affirming that they actually are science. Ham seems to know his attraction shouldn’t make the cut, which is why he’s fallen back on another traditional creationist justification for it—that a visit would also teach students how to think critically. (Louisiana and Tennessee also have laws that allow creationism to be taught in school based on this premise that it promotes critical thinking.) Presenting the Ark “objectively” would help schools “to develop the critical thinking skills of their pupils,” Ham said. Of course, the only critical thinking skill that could be learned on these field trips is how to debunk bad science. Still, Ham’s statement is a small improvement over his past statements about creationism in public schools. In response to a previous Slate investigation about field trips to his Creation Museum, he claimed that he didn’t promote creationism to public schools. “We’ve never tried to get creation taught in school,” he said. At the time, it was clear he was lying. He’s finally dropped the pretense.